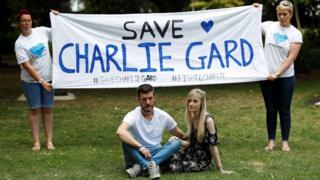 Few British legal cases in recent years have proved as controversial or emotionally charged as that over the fate of Charlie Gard, the 11-month-old baby who died on Friday after a lengthy battle over his medical treatment. During the many hours of legal debate in court, Katie Gollop QC, who led Great Ormond Street's legal team, described the case as "sad", but not "exceptional". She was wrong. The case, which saw Charlie's parents take on the world-renowned hospital in the courts, was one of those rare cases that transcend the cut-and-thrust of legal argument. Its impact reverberated around the country and the rest of the world, prompting protests on the streets, a mass outpouring of emotion on social media, the vilification of one of the most famous hospitals in the world and the intervention of both the Vatican and US president. In doing so, it made us question the role of the parent, the motives of doctors and - as always in this digital age - wonder about the ever-growing influence of the internet. How did it come to this? And what does it tell us about society? Great Ormond Street Hospital (GOSH) is perhaps the most respected and well-known children's hospital in the world. It has been synonymous with excellence ever since it was founded in the 1850s with patients from all over the world now being sent there for pioneering treatment. One of the problems the hospital faced, particularly as the case developed and the parents received more media attention, was that it simply could not win. While Charlie's parents gave television and newspaper interviews and made pleas on social media, GOSH was left to rely on media statements and court papers to explain its position. The hospital said it was not possible to give Charlie the non-invasive treatment - a powder that could be added to his food - that his parents felt could help him in his battle with mitochondrial depletion syndrome, a condition which causes progressive muscle weakness and brain damage. Rational, scientific logic was never going to win hearts and minds against the raw emotion of parents trying to do everything they could for the severely ill baby. Should more have been done by the world of medicine? As the case developed, GOSH started publishing more details about the case and its position. But Prof Uta Frith, an expert in cognitive development at University College London, wonders if there is a lesson here, arguing science cannot be entirely stripped of its emotional context. "We can never be 100% certain about our facts and theories. Emotion, which is utterly certain, wins in comparison. "However, scientific reasoning cannot be completely stripped of emotion. Perhaps this is an asset we need to cultivate more. Reasoned evidence needs champions to engage the hearts of people." But the case - and its importance - also comes down to a dilemma that becomes more acute as medicine develops. At what point is it appropriate not to treat patients and allow them to die? These are discussions that go on every day in hospitals - and the overwhelming majority are resolved without major dispute. Patients coming to the end of life - both the elderly and the young - are now routinely encouraged to discuss advanced care plans setting out how much they want doctors to do when they get closer to death. These plans cover everything from when it is appropriate to resuscitate to when treatment should be withdrawn and a patient moved on to palliative care to help them die with dignity. Of course in Charlie's case, because he was a baby, this was simply not possible. Instead, he was kept alive on a ventilator while his parents and doctors took to the courts. The medical profession - bound by the basic tenet of medicine "do no harm" - felt it was in his best interests to let him die with dignity rather than have an experimental treatment that they believed would do him no good. In court they argued he had "no quality of life and no real prospect of any quality of life". But there is also an ethical dimension to this. Are doctors the right people to determine what constitutes "quality of life"? Do we put too much emphasis on their opinion? It is a point made by Prof Julian Savulescu, an expert in ethics at Oxford University. He believes Charlie's parents should have been allowed to take him to the US earlier in the year - even with the low odds that the treatment would have worked - given that they had raised £1.3m themselves. He says GOSH - and the doctors the hospital consulted - made a "value judgement" that was reasonable to disagree with. "The state should not have to pay for expensive experimental treatment with low prospect of success, but Charlie's parents have raised the funds," he says. "Charlie should have been allowed to go straight away - and saved hundreds of thousands of pounds of British taxpayer funds which have been used to provide months of intensive care. "This is not a religious or right-to-life argument or an argument based on compassion. It's a secular ethical argument about the extreme complexity of judging someone's life to be not worth living." But that brings us on to one of the key arguments put forward by Charlie's parents during the hours of legal discussion - the rights of parents to make decisions for their children. They believed it should have been up to them to decide what was best for their son. But this is not what the law says. The 1989 Children's Act, which was introduced following a child abuse scandal in Cleveland, makes it clear that where a child is at risk of harm the state can and should intervene. Subsequent legislation has followed and a framework has been created whereby the state has been emboldened to challenge the view of parents where they believe children's best interests are not being served. This sees doctors oppose the decision of parents who are Jehovah's Witnesses and refuse blood transfusions for their children. The law is also used by councils to take children they believe are at risk into care. Of course, proving someone is at risk or can be helped by medical treatment is much easier to do than proving a treatment is no longer in the best interests of a child when the parents disagree. But what was often overlooked in the Charlie Gard case was that it wasn't just the doctors against the parents. Charlie also had an independent guardian who agreed with the hospital. Daniel Sokol, a medical ethicist and barrister, says the case has shone a light on this issue. "It reminds us that the rights of parents over their children are not absolute. They are limited by what is in the best interests of the child." But he says it is interesting that in the US, which played such a key role through the intervention of doctors who said they would be prepared to treat Charlie, and because of President Donald Trump's offer of help, the rights of parents to decide what is best are much more enshrined. "The wishes of parents and 'surrogates' generally carry more weight, which is why many US commentators have expressed surprise at the hospital's handling of this case," he says. "For them, the doctors should do what the parents want." It's fair to say this case simply would not have played out the way it did in the pre-internet age. It was with the help of social media and crowd funding that Charlie's parents were able to raise the funds for him to be treated in the US in the first place. And it was via the internet that the parents were able to make a video appeal - just at the moment that it looked like Great Ormond Street would remove life support - to be given longer to say goodbye. A week later the Vatican and Donald Trump intervened and the case ended up back in court. This time the issue was whether new evidence about the treatment warranted a re-think of the ruling that he should be allowed to die. Mr Sokol says the influence of the internet was "remarkable". "Through the internet, in particular social media, the family obtained an enormous following, support from influential persons and vast amounts of funding. "The family can find doctors, on the other side of the world, who will support their case." Indeed, if there is to be one overriding legacy of the Charlie Gard case it is likely to be related to this. There is already a long-term trend towards greater scepticism of medical opinion. Coupled to the power of the internet this could create an environment whereby doctors find their decisions increasingly challenged.